Tokyo Disneyland is currently in a multi-year process of developing new rides and expanding areas within the park. When the work is complete in Spring 2020 guests will find new attractions, entertainment, shopping and dining experiences. 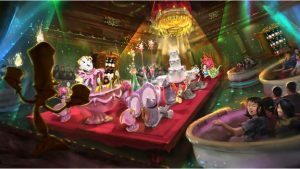 Today, Disney shared video and concept art of some of the new rides and attractions -- including a Beauty and the Beast themed area. See a video of the new ride and concept art here. 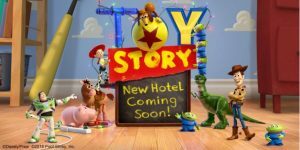 Oriental Land Co., Ltd. announced today a new Toy Story Hotel will be coming to Tokyo Disney Resort in 2021 or early 2022. Learn more about the immersive hotel here. In addition to the ongoing Tokyo Disneyland development, including a "Beauty and the Beast"-inspired area and a "Big Hero 6" attraction, Tokyo DisneySea will be expanded in 2022 with an eighth port to include the Disney films "Frozen," "Tangled" and "Peter Pan." A new deluxe hotel with a one-of-a-kind luxury wing will also be connected to the port. Walt Disney Company president Card Walker, left, and Masatomo Takahashi of the Oriental Land Co. sign an agreement in 1974 to join forces in the creation of Tokyo Disneyland. [The Walt Disney Company] CHUCK SCHMIDT / Still Goofy About Disney AllEars.Net Guest Blogger On Oct. 24, 1982, E. Cardon Walker stepped onto a small podium … Continue reading "In greenlighting Epcot and Tokyo Disneyland, Card Walker cemented his Disney legacy"
The Disney parks go all out when it comes to themeing and that includes details like the trashcans, light fixtures, concrete color, and background music. Benches also are a huge part of the story in the parks. Imagine my surprise when I entered Tokyo Disneyland and found this familiar Roy and Minnie Bench! And just … Continue reading "Disney Pic of the Week: Benches"
Several members of the AllEars team spent most of March visiting Disney destinations far from home. We visited Hong Kong Disneyland, Tokyo Disneyland, Tokyo Disney Sea, and Aulani in Hawaii. Along for all or part or this journey were AllEars&apos; Deb Wills, Laura Gilbreath, Lee Zimmerman, Jeanine Yamanaka, Linda Eckwerth, and Deb Koma, and friends Jack and Pete. 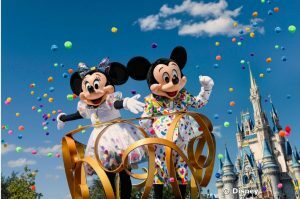 This report covers Day 4, Tokyo Disneyland and Tokyo DisneySea.